Being young rules, except you don't know it does until you're old. I always say the reason why my brain doesn't work correctly is that I consciously know that things aren't black and white but I wish super hard for it to always be that simple. Especially this one: you're young and then you're old and you're supposed to have it figured out. Because if young people had it figured out, there wouldn't be any Kesha songs. I am at the end of my twenties. That sounds scary and surreal and kind of not okay. It's not that I'm some sort of Peter Pan club girl that can't stop wearing minis and stumbling around in stilettos. I think the weird part is that you get to an age that was supposed to be some sort of milestone. And it ends up just being another birthday. And I plan on living past 31. Please? None of my wild and crazy ideals about my life came true exactly how I planned. I somehow thought it would all just work out after college and I'd be a grown up with a 401k and a wine cellar. That didn't happen. And I'm glad. Because grown ups, how I always envisioned them, are lame. They don't think anything is funny. They have heartburn. They don't dance unless they're drinking and even then it's more of a shaking twitching movement. They yell a lot and get tired easily. They hate loud music and are always frowning. They don't have any good friends. And they never buy new clothes. These are all unfair stereotypes, partly supplied by sitcom families and young adult fiction. But either way, I don't think the point is to have it all figured out or get a wine cellar. If you think someone has it all figured out, they are either a wise old sage about some things or they are liars. We are all lost and scared about it. That's the truth. But I think I get so into trying to be a grownup that it actually gives me heartburn. Do we really have to lose our silly while we're trying to keep it together? Or are we just trying to flex our frown lines because its easier to complain than see what is all of the good? I read something on Pinterest this weekend, the latter-20-something's version of clubbing, that needs to be shared and discussed. It was longer than this, but this part was the best. "There is a season for wildness and a season for settledness, and this is neither. This season is about becoming. Don’t lose yourself at happy hour, but don’t lose yourself on the corporate ladder either." Don't turn your wild side into stories you recount with old friends. Rock some big hair or dress up when you're feeling bad about yourself, even if its Tuesday, especially if its Tuesday. Don't take yourself so seriously. Laugh at fart jokes and try to balance a spoon on your nose. And don't stay at a job you don't love just because you think that's what you're supposed to do as an adult. Don't tell yourself that its not that easy. Cancel your cable bill, stay out of the mall, make your own coffee and live simpler. Then quit your job and become a whatever. Don't forget what it felt like to take chances and get exactly what you wanted. The best part about being young was that you had permission to make mistakes, but you still do. And finding a balance, between your wild and impulsive beautiful self and your smarter, more experienced self, is the best part about getting older. Otherwise, you'll just turn into a middle-aged woo girl at Club Soda, growing sideways (which is exactly how middle aged woo girls get anywhere when they're drunk). My best friend Lindsay told me a long time ago, that whatever you do, rock it. If you're a waiter, rock being a waiter. If you're a dentist, rock that dentistry. 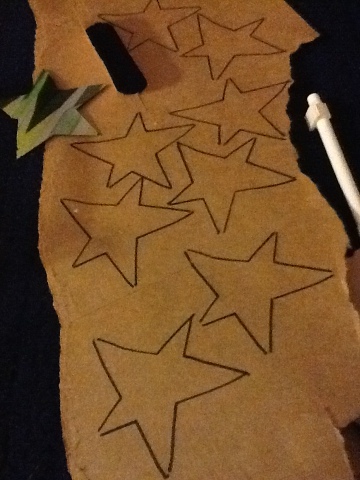 And I'm coming into this as I work from home til 9 tonight, meaning I'm cutting out cardboard stars to attach to straws so my students can have magic wands to accompany our story tomorrow. Because I'm sick of crying about how hard it is and how I miss how it used to be. Save the crying for something sad. Now is the time to dance and sing and be thankful and wave your magic wand and make up magic words and laugh til you cry happy things. Here's to trying really hard to do that.